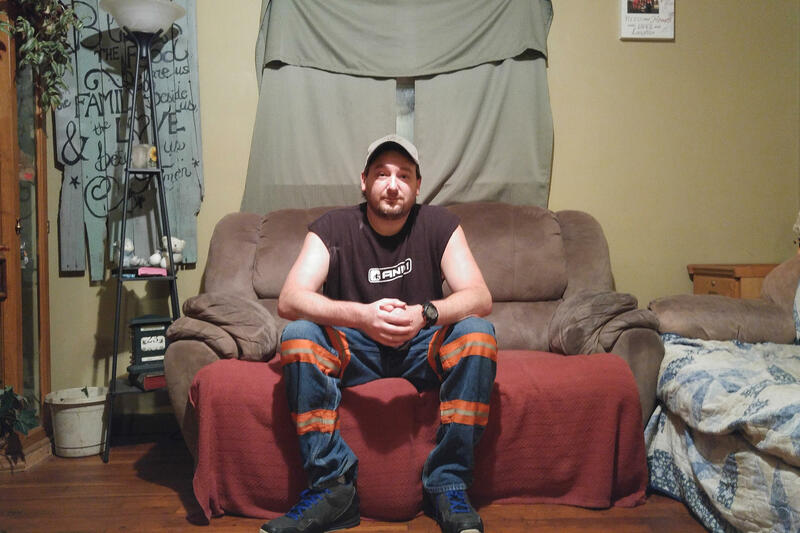 Branham wears reflective mining pants in his home in Elkhorn City, Ky. Branham has advanced stage black lung and was forced to quit mining earlier this year. 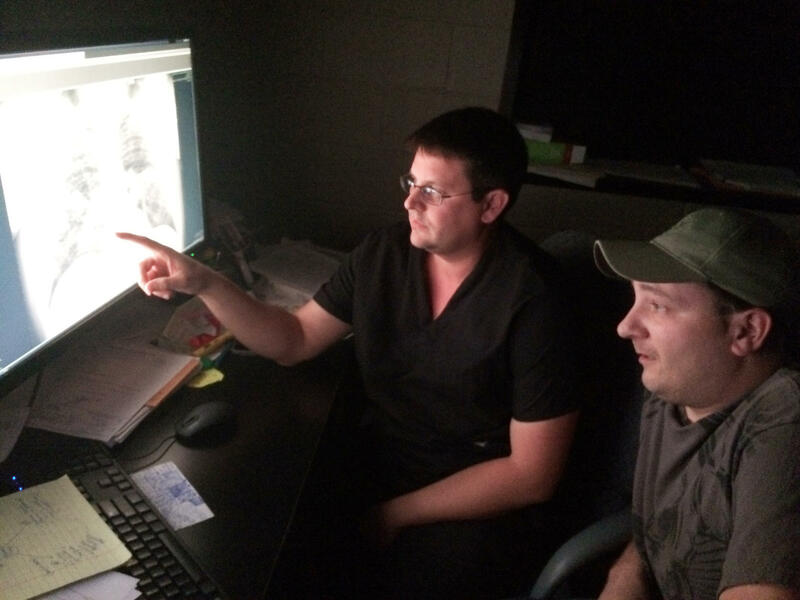 Radiologist Brandon Crum and former coal miner Mackie Branham, 39, view an X-ray of Branham's diseased lung at Crum's black lung clinic in Coal Run Village, Ky. The Sidney Coal Co.'s Coal Preparation Plant in Sidney, Ky., in 2006. Ron Carson is the director of the Black Lung Program at Stone Mountain Health Services in St. Charles, Va. "Something major is going on," he says. 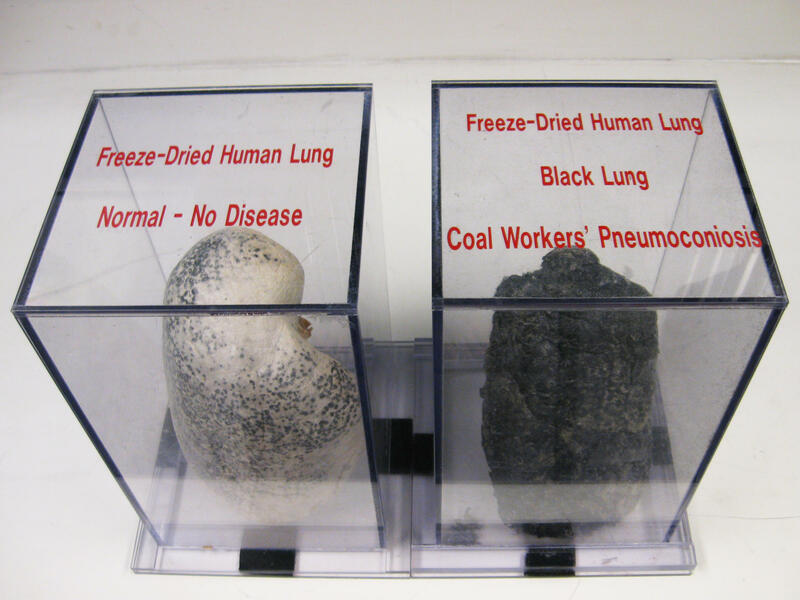 A display case at NIOSH shows a normal lung and a diseased black lung from inhaling coal dust and other harmful particles while coal mining. 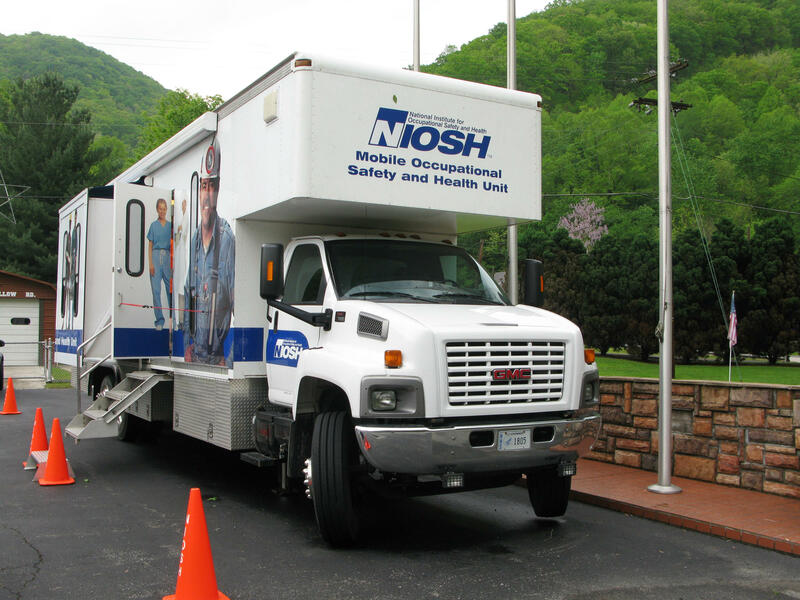 A NIOSH black lung surveillance van at the fire station in Wharton, W.Va., in 2012. The government, through the National Institute for Occupational Safety and Health, reported 99 cases of "complicated" black lung, or progressive massive fibrosis, throughout the country the last five years. "The actual extent of PMF in U.S. coal miners remains unclear," says the report, which appears in this week's issue of the Morbidity and Mortality Weekly Report, published by the Centers for Disease Control and Prevention. "I can't say that I've heard really anything worse than this in my career," says Robert Cohen, a pulmonologist at the University of Illinois, Chicago who studies and tracks black lung. "I can't think of anything in this particular field ... that's more frightening than this," Cohen adds. Edward "Lee" Petsonk of West Virginia University has spent three decades addressing the disease and finds NPR's numbers "very disheartening, very disappointing." "I've spent much of my career trying to find ways to better protect miners' respiratory health," Petsonk says. "It's almost like I've failed." NIOSH released a report Thursday, published in the Morbidity and Mortality Weekly Report, which focuses on a small health clinic in Kentucky with 60 cases alone of PMF in 20 months. The report acknowledges cases are being missed by the government's count; it concludes: "The actual extent of PMF in U.S. coal miners remains unclear." "The more I talk, the more I get out of breath"
Mackie Branham, 39, of Elkhorn Creek, Ky., spent 19 years mining coal until he was diagnosed with complicated black lung. He ran monstrous mining machines and drilled bolts into mine roofs — occupations NIOSH says can involve excessive mine dust exposure. He worked double shifts and seven-day weeks every chance he had. His gallbladder was removed one day and he says he was back at work the next. He took two days, he says, after knee surgery, before working a 12-hour shift drilling bolts. But severe breathing problems forced him to leave work in March. And he struggles for every breath now. "My dad has got it. Everybody that has got it, got it when they had like first stage or so. I'll probably be the first born to be this bad in the family," Branham says, describing a family legacy of black lung. "They can't breathe but they can still get up and walk around and do stuff. The more I talk, the more I get out of breath. It's like I ain't got no capacity." Branham was diagnosed with PMF at United Medical Group, a clinic in Coal Run Village, Ky., that was the subject of the NIOSH study. Radiologist Brandon Crum was alarmed by the numbers of miners coming in with such severe disease, including some like Branham, who were in their 30s and 40s and worked less than 20 years underground. So he contacted NIOSH researchers. "I think the percentage of black lung that we're seeing now here in central Appalachia is unprecedented in any recorded data that I can find anywhere," Crum says. "In this clinic we're roughly around 9 to 10 percent complicated rate, which is around three times higher than even the highest reported numbers." NIOSH researchers gathered at the clinic and verified the diagnoses. They, too, were alarmed. "The current numbers are unprecedented by any historical standard," says NIOSH epidemiologist Scott Laney, who has focused on black lung as well as the recent Ebola outbreak in Africa. "We had not seen cases of this magnitude ever before in history in central Appalachia." Crum tells NPR he diagnosed 10 more cases of PMF since Laney and his colleagues left the clinic. Life with PMF is bleak. It's incurable and fatal. Fifty-three-year-old Charles Wayne Stanley of Pound, Va., is matter-of-fact about his future. "Staying on oxygen 24/7, dying of suffocation, that's what I've got to look forward to," Stanley says, as he sits in a clinic in St. Charles, Va.
"I've seen it too many times. My wife's grandpa ... [I] watched him take his last breath. I watched my uncle die with black lung. You literally suffocate because you can't get enough air. That's my prospects." Stanley says his diagnosis includes black lung and silicosis. In just the last three years, 644 cases of complicated black lung were diagnosed at Stone Mountain Health Services, which operates black lung clinics in St. Charles and two other Virginia communities. That's six times the NIOSH national count in nearly half the time. "I'm not an epidemiologist or a scientist or a doctor," says Ron Carson, who manages the clinics. "I just see the results that come through the doors, and something is going on. Something major is going on." Laney and his colleagues acknowledge in their paper that they have missed hundreds of cases with their national surveillance program. By law, they can X-ray only working miners and the testing is voluntary. NIOSH data show most miners avoid that testing. Only 17 percent of all working Kentucky miners were tested in the NIOSH program since 2011. Stanley waited until he was out of work, after 30 years mining coal, before he got his first chest X-ray. Miners avoid the NIOSH testing, he says, because they worry it could cost them their jobs. "If you're working and you go and have that stuff done and the company finds out about it, they'll find a way to get rid of you," Stanley says. "As long as you're working and producing you're an asset. But now when you get something wrong with you, you become a liability. And they'll find a way to get rid of you." The last company a miner worked for (for at least a year) is saddled with black lung benefits payments and medical care — even if the miner spent 20 years working somewhere else in excessive dust. It's the last employer who pays. But it's against the law to punish or fire miners for getting X-rays or being diagnosed with disease. Bruce Watzman of the National Mining Association also says mining companies are not supposed to see the X-rays. "Those results are not shared with any employer. It's at the miner's discretion the way the program operates today when and if to divulge that information," Watzman says. Still, the fear is widespread. So missing from the official NIOSH counts in the last 40 years are the working miners avoiding X-rays, and miners who are retired or laid off. More than 40,000 miners lost their jobs since 2010. Six hundred mines have closed. And those out of work are now flocking to clinics to get screened for the disease and apply for black lung benefits. Last year alone, 3,000 miners showed up at the Stone Mountain clinics. "I'm seeing miners now feeling that there's no hope. I think that they have really come to the realization that there's other energy out there now that is going to override any coal," Carson says. With the increased testing, more cases of complicated black lung are being diagnosed. Cohen, Laney and other black lung experts believe thinner coal seams in central Appalachia are likely to blame for spikes in complicated black lung. The thickest seams are mostly gone. The thin seams that remain have coal embedded in rock, and that rock contains quartz. Cutting quartz and coal together results in mine dust that includes silica, which is especially toxic in lung tissue. Stanley worked in so much dust he labeled his mining machine the dust dragon. "They kept getting less coal and more rock. So you're cutting 19 inches of coal, you're cutting 50-60 inches of rock," Stanley recalls. "And the more rock you cut the more dust you're going to eat." There's also the practice of slope mining, where crews cut solid rock to reach coal seams. Burnham did that in Kentucky for six straight months, working 14 16-hour shifts at one point. It was "pure rock dust," he says. "I had my respirators on and you'd actually have to remove it to help take a breath every once in a while because the dust packed so much around your filters you couldn't get no air in." Protective masks are among the controls that are supposed to prevent inhalation of coal and silica dust. Robust ventilation in mines is supposed to sweep dust away. Water sprays are used to tamp down dust. Kentucky miner Barney Stanton says those things didn't always work, even when most of the companies he worked for provided proper safety gear. "It's hard to wear a mask and do a physical job," he says. "Just trying to do your job, you breathe so hard the dust will come in around the mask." Stanton has been diagnosed with the most serious stage of PMF and is awaiting a lung transplant. "The mining game is a numbers game," Branham says. "If you don't produce coal, they'll put somebody else in your spot that can. If I've got another man on the other side of the mines, he's cutting more coal than me, it's not going to look good on me. I just thought about my family to be honest with you." Mining jobs are often the best-paying jobs in central Appalachia, where there generally are few other options for work. New and tougher federal limits on mine dust exposure fully took effect in August, and they get even tougher when there's excessive silica. Simple black lung and PMF can take a decade or longer to develop, so the spike in disease is not an indication that new limits are failing, says Watzman of the National Mining Association. "So I think we're talking about historic exposures and not the exposures we're seeing today." Watzman's group sued to keep the new dust rules from taking effect, but he acknowledges positive impact. "I think that miners that are working today are better protected because the silica levels have come down," he says. Silica dust is down, on average, 50 percent since 2009, according to the federal Mine Safety and Health Administration, whose director is Joe Main. "I think if the rules are followed as they are prescribed we would not have these diseases," Main says, while also posing this question: "Is the strength of the rules that are in place adequate enough to protect miners? I think that's the question of the day." There are some holes in the new rules when it comes to silica. For example, it can take a week or more to detect silica in dust samples, so excessive exposure isn't quickly addressed. Also, the U.S. Department of Labor has failed to take action on proposed dust rules specifically targeting silica. Every other industry cutting rock has strict limits on silica exposure, except mining. Main, whose tenure will end with the change in administrations, wouldn't commit to a silica limit. "I think if the evidence points in that direction then that needs to be done," he says. It'll be a decade or more before the effectiveness of the new rules is known, because it takes that long to detect the disease in lungs. In the meantime, there are the cases NPR has identified. According to year-by-year data reported by NIOSH, our count this decade (962 cases) is more than double the cases NIOSH counted in the last 40 years (441). NPR also did not receive complete numbers from some clinics and did not get data from eight others in the heart of the region experiencing the spike. So there are very likely many more cases that are uncounted. 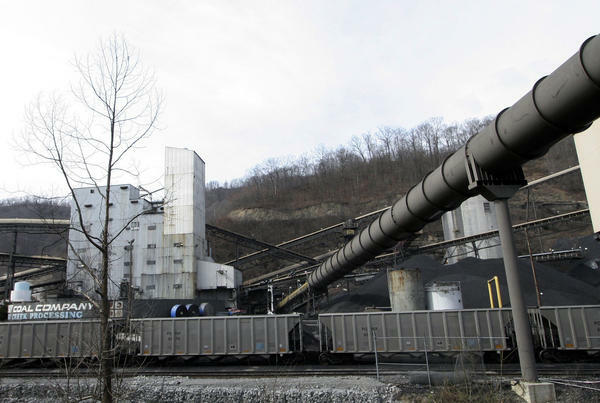 That suggests more and more severely diseased miners will be seeking state or federal black lung benefits, which concerns Evan Smith, an attorney at the Appalachian Citizens Law Center in Whitesburg, Ky., which helps miners file for benefits. "You're just putting more people into the system that need compensation, so the more people we have moving into the system, the more potential burden it places on the taxpayers," Smith says. There are also younger miners now being diagnosed, so benefits payments and health care may be required longer. There may be more demand for expensive lung transplants. "The treatments run from a half-million to a million dollars," notes Rep. Bobby Scott, D-Va., the ranking member of the House Committee on Education and the Workforce. "So, if there are cases out there that have not been counted then we have a lot of expenses [coming] that we don't expect." That increased demand comes as the Black Lung Disability Trust Fund is stressed. The fund is nearly $6 billion in debt. It has taken on 1,000 claims that were covered by self-insured mining companies until they went bankrupt. And the coal excise tax that supports the fund is set for a 50 percent cut in two years. "I think there are real reasons to be concerned about the viability of the trust fund," says Smith. There is also concern involving possible repeal of the Affordable Care Act, which contains a provision that makes it easier for miners to get black lung benefits. Scott has asked the Government Accountability Office to investigate the trust fund's ability to continue to pay claims. He also wants more accurate numbers of miners afflicted with progressive massive fibrosis. "We have to get the numbers straight to make sure they're being properly reported," he says. In Kentucky, Mackie Branham has more immediate concerns. He heard this week he'll be getting state black lung benefits soon. He is hoping the first check arrives before Christmas so he can buy presents for his five children. He is also left gasping for air and grasping for words. He worked hard to feed his family and now, as his life leaves him one breath at a time, he wonders about the cost. Branham has "never been scared of death," he says, as he chokes back tears. "It don't bother me a bit. It's just not seeing my kids grow up. But if I had it to do over I would do it again, if that's what it took to provide for my family as long as I have." Branham hopes for a lung transplant, which may give him five to 10 more years of life. Jeff Young and Benny Becker of Ohio Valley ReSource contributed to this story. Additional reporting on this story is available here and here. Clinic directors across Appalachia have been telling NPR the same thing for months now - something is terribly wrong. They're seeing more and more advanced cases of the deadly coal miners' disease black lung. Nationwide, less than a hundred cases were reported to the government in the last five years. Federal researchers confirmed today a recent spike at one clinic in Kentucky, but clinics around Appalachia contacted by NPR say there have been at least a thousand cases in that time. Here's NPR's Howard Berkes. HOWARD BERKES, BYLINE: One of those case files carries the name Mackie Branham, and he was one tough coal miner. In 19 years underground, the 39-year-old from Elkhorn Creek, Ky., ran monstrous mining machines. Sometimes he worked double shifts and seven straight days. His gallbladder was removed one day. He says he was back at work the next. But listen to Branham now, struggling to breathe, struggling to talk about a family legacy of black lung. MACKIE BRANHAM: I'll probably be the first one to be this bad in the family. BERKES: And what do you mean - this bad? BRANHAM: For it to actually be this progressive and in this bad of shape. I mean, don't get me wrong. They can't breathe, but they can still get up and walk around and do stuff. More I talk, the more I get out of breath. It's a lot of pressure in my chest all the times. BERKES: Branham sits in a clinic in Coal Run Village, Ky. A computer screen shows an X-ray of his damaged lungs, with large knots of fibrotic tissue. The image lights up his tired face, reddened eyes and the reflective stripes on his blue miner's pants. He still wears them, he says, even though he stopped working in March. BRANHAM: I probably will till the day I die. I've always been a coal miner. And if they would give me lungs so I could go back tomorrow, I would. It's just in my blood. BERKES: He has progressive massive fibrosis, or complicated black lung. It's the worst stage of the disease. It's incurable, and it's fatal. Miners get it from inhaling coal mine dust. And it hit Branham at a much younger age and is getting worse more quickly than what used to be typical. There's nothing typical, says Brandon Crum, the clinic's radiologist, about the disease he's detecting now. BRANDON CRUM: I think the percentage of black lung that we're seeing now here in Central Appalachia is unprecedented in any recorded data that I can find anywhere. In this clinic, where we're roughly around nine to 10 percent complicated rate, which is around three times higher than even the highest reported numbers. BERKES: Federal researchers test thousands of minors for the disease, and they've reported 99 cases of complicated black lung across the entire country in the last five years. And yet Crum's little clinic alone, in just the last two years, diagnosed 70 cases. NPR checked other clinics across Appalachia. Eleven responded from Virginia to Pennsylvania. Combined, they told us, they've diagnosed 962 cases so far this decade. That's 10 times the official count. RON CARSON: Something's going on. Something has happened that has caused these numbers. BERKES: Ron Carson manages three clinics in Virginia, which report 644 four cases of complicated black lung in just the last three years. He used to see it in miners in their 60s and 70s with decades underground. Now they're as young as 30 with less than 10 years of mining. CARSON: I'm not an epidemiologist or a scientist or a doctor. I just see the results that comes through the doors, and something is going on. Something major's going on. BERKES: Brandon Crum in Kentucky was so alarmed he convinced the National Institute for Occupational Safety and Health to investigate. Epidemiologist Scott Laney is publishing findings tomorrow. SCOTT LANEY: The current numbers are unprecedented by any historical standard. We have not seen cases of this magnitude ever before in history and in Central Appalachia. The numbers of cases that we were seeing - and then with these additional cases - far exceeds anything that we were aware of. BERKES: So what happened? First of all, the federal researchers tracking the disease have missed hundreds of cases. By law, they're tracking program only X-rays working miners, and the testing is voluntary. Virginia miner Charles Stanley spent 30 years mining coal, but didn't get his first chest X-ray until he was out of work. CHARLES STANLEY: If you're working, and you go and have that stuff done, and they find - and the company finds out, they'll find a way to get rid of you. As long as you're working and producing, you're a asset. But now when you get something wrong with you, you become a liability, and they'll find a way to get rid of you. BERKES: That's actually against the law, says Bruce Watzman of the National Mining Association. BRUCE WATZMAN: Those results are not shared with any employer. It's at the miner's discretion - the way the program operates today - when and if to divulge that information. BERKES: Still the risk is widely believed and feared. More than 80 percent of Kentucky's coal miners stay away from the government's testing program, According to the program's reports, so most working miners are missing from the federal count, along with those retired or laid off. More than 40,000 lost their jobs since 2010. Six hundred mines closed with little hope of reopening. Miners then go to clinics, hoping they'll qualify for black lung payments and health care. Last year alone, 3,000 showed up at Ron Carson's Virginia clinics. CARSON: I'm seeing miners now feeling that there is no hope. And now that they are unemployed or the coal mine laid off or shut down, well, I need to go in and see about my black lung benefits. So they come in the door, and we do the chest X-rays, and there it is. BERKES: So there are more cases now of progressive massive fibrosis - of complicated black lung - because more miners are getting tested. ROBERT COHEN: But any way that you cut it, this is more disease because we haven't seen numbers of this magnitude. 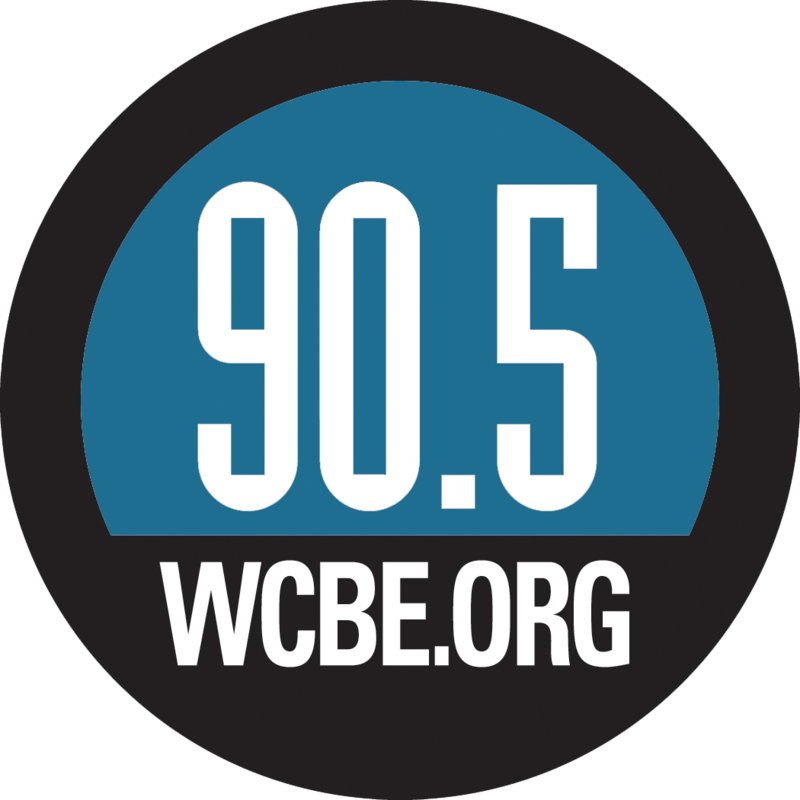 BERKES: Pulmonologist Robert Cohen of the University of Illinois at Chicago has tracked black lung for 30 years. COHEN: And I can't say that I've heard really anything worse than this in my career. BERKES: Cohen is so alarmed by NPR's count that he's planning a thorough study of black lung clinics nationwide to get an accurate number of sick miners like Mackie Branham, who's left gasping for air and grasping for words. BRANHAM: Me - I've never been scared of death. It don't bother me a bit. It's just not seeing my kids grow up, but if I had it to do over, I would do it again if that's what it took to provide for my family as long as I have. BERKES: Branham hopes for a lung transplant, which may give him five to 10 more years of life. Howard Berkes, NPR News. CORNISH: Tomorrow we'll look at the mining conditions that destroy lungs and the strain on the federal benefits program for miners. Transcript provided by NPR, Copyright NPR.